"I too had a love story"
Why is the book title in past tense? What kind of a love story? With these kinds of umpteen number of questions, I started reading this book named, "I too had a love story"
It is written by an Indian, Mr.Ravindar Singh. The book is claimed to be the author's true life story. The author looked young in his photograph and I decided that the book would be about his love during teenage. The first page itself proved me wrong and I loved the book for that. It turned out to be a love story between the central characters - Ravin and Khushi. They virtually meet in a marriage portal. Thus, start texting and talking! They both would not have met personally. So, he decides to go to her home and meet her. She turns out to be a really pretty girl. Her family will be a very fun and warm one. Ravin feels at home and loves Khushi more for that. The engagement date draws nearer. 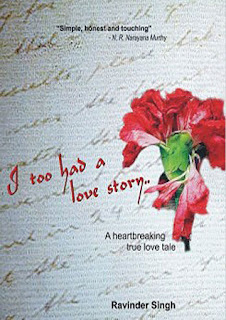 Simple words and outstanding narrative makes "I too had a love story" a book that can be cherished for a life time!!! And those who are in search of love!!! The blog is fast changing into 'My Book review' type one.... the 'crazy' depiction of wide array of topics needs to be incorporated into the blog to stop it from being 'LABELLED'-- ??? What wud be the real pain?? ?